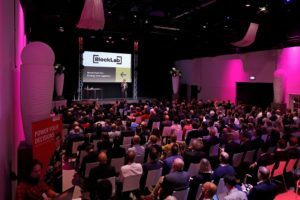 The Municipality of Rotterdam and the Port of Rotterdam Authority jointly launched a field lab for the development of applications and solutions based on blockchain technology – the BlockLab. The BlockLab, serving as a knowledge centre, will develop theoretical ideas, test them and work out into concrete opportunities in a real-world environment. Blockchain is a shared, encrypted database that allows users to securely conduct transactions without involving a third party. Data technology guarantees the necessary checks and ensures that the transaction is processed automatically and without any fraud. Although so far it has not been used much outside cryptocurrencies such as bitcoin, where the technology originates, blockchain has a huge potential of a revolutionary tool that can be used in various fields including global trade, shipping, logistics, financial services. Ports and shipping companies already start investigating this innovative technology and search for application opportunities. We already wrote about a mutual work of Maersk and IBM on a blockchain-based solution to manage transactions between shipping lines, shippers, freight forwarders, ports and customs. In July, Antwerp Port Authority, jointly with the City of Antwerp and the University of Antwerp, announced the launch of a pilot project for secure and efficient release of containers. One of the possible applications of the technology could be a finely meshed decentralised power network, in which companies can trade residual heat and city dwellers can trade electricity. This might give a new impetus to the energy transition in the port and the city. BlockLab will be financed by the Port of Rotterdam Authority and the Municipality of Rotterdam and will be also supported by the regional development corporation InnovationQuarter. Initially, BlockLab will consist of a team of five working from the Cambridge Innovation Center in Rotterdam. But collaborating with Rotterdam University of Applied Sciences, the field lab may be later supplemented with new talented blockchain researchers.